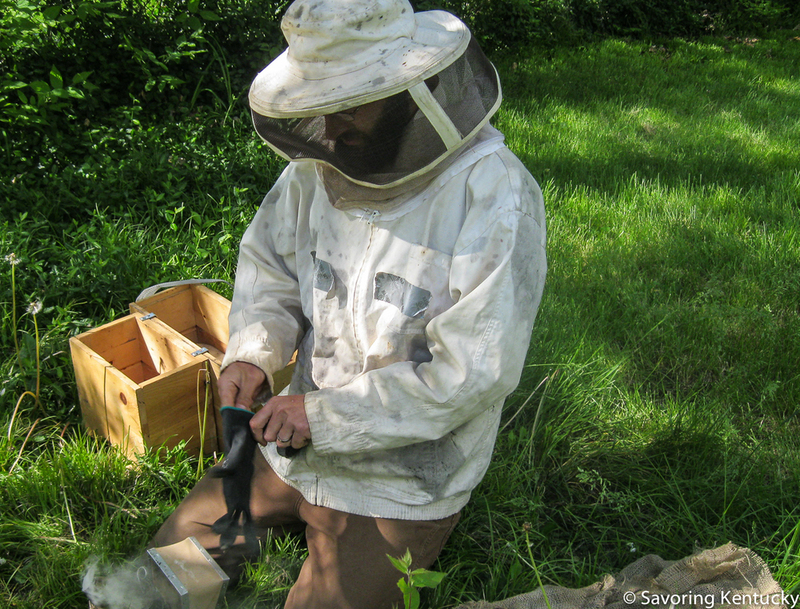 Grant Clouser of 5th Street Apiary made me (and a billion plants) happy when he decided recently to re-launch honeybee colonies in the Old Episcopal Burying Ground that is just behind our house. The two hives the Apiary has supported there in past years succumbed over the winter, and we had a stretch of spring without many obvious honeybees. 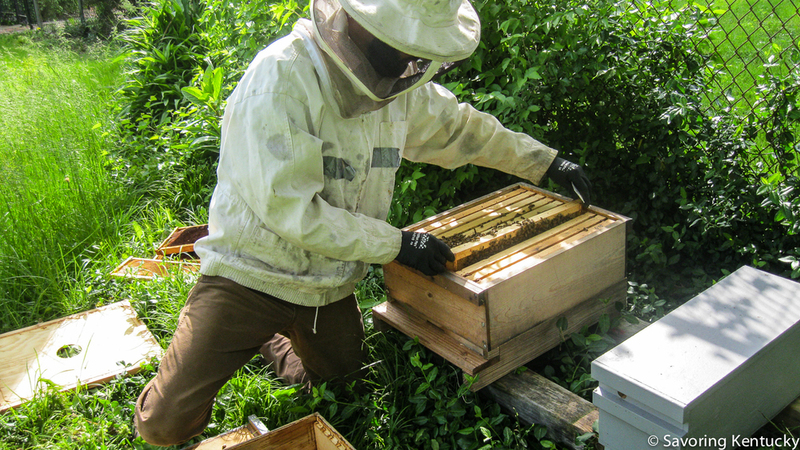 We live in the center of our city, where urban bee-keeping makes a huge difference in the success of the urban gardens and orchards that Seedleaf and others cultivate here. A thousand thanks to Grant and Jess of 5th Street Apiary, the honeybees, and Christ Church Cathedral, which owns the OEBG and London Ferrill Community Garden and Orchard spaces, dedicating significant land to urban food production. Here's Grant, preparing to switch the two new honeybee colonies (I hope that's the proper term) from their starter apartment-sized homes into full-sized hives. The "before" homes of the bees: cute but crowded. 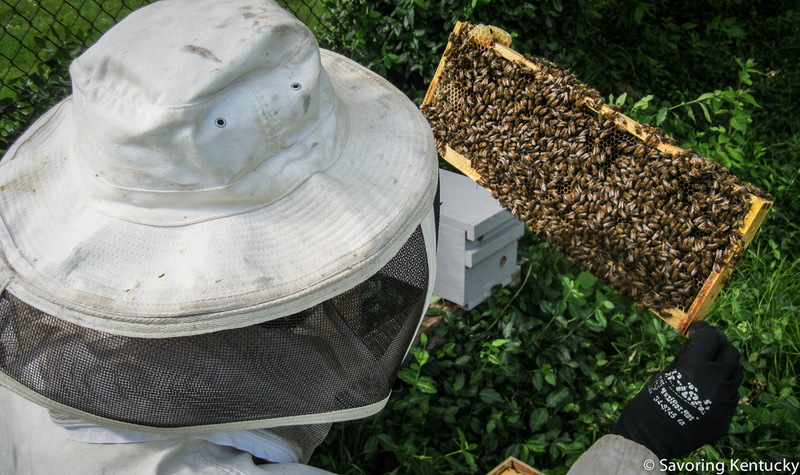 Tender care: checking a frame to see what the bees are up to. Grant says they look good and are doing all the right honeybee things. Moving into new quarters: a full size hive. Grant told me that central Kentucky honeybees have to do much of the work of gathering pollen and sustaining themselves for a full year during the big spring flush of flowers that is just now ending. Locust blossom petals are snowing down today, and the wind before yesterday's whopper rainstorm swirled all manner of seeds and flower petals into scary looking standing columns on some Lexington streets. But after this? We all need to to plant more flowers that bloom from June until frost. And, of course, lay off the pesticides. Some lists of flowering plants that appeal to bees are here and here. As inexperienced urban orchardists, we suspected pollinator scarcity meant that our young cherry trees' blossoms did not get fully pollinated this spring. We have some green cherries, and some blossoms look like failures. Or maybe not! We are novices who look forward to beating the birds to these fruits and making, at the very least, cherry soup.